This is a guest post by Marie Cloutier. Check out her website, The Boston Bibliophile, and follow her on twitter @MarieKCloutier. 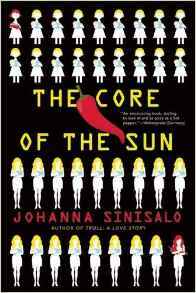 James Tiptree Jr. Award-winner Johanna Sinisalo takes us on a trip through a reimagined modern day Finland in The Core of the Sun (translated by Lola Rogers), as a young woman at odds with the rigid gendering laws of her society searches for her missing sister all the while battling her growing despondency through an addiction to capsaicin and black-market chili peppers. Vanna, or Vera as she was born, has come of age in a culturally isolated Finland in which women are divided into two female genders- ultra-girly elois who are allowed to marry and have children, and sterilized morlocks destined for a life of sexless squalor and manual labor. Vanna herself is a morlock by temperament but tries to pass as an eloi because everything about her culture teaches her that to be an eloi is to be accepted, loved and celebrated while morlocks are scorned and rejected. Her beautiful sister Manna doesn’t have to pretend though and accepts the life of an eloi without question. The sisters’ relationship as seen through Vanna’s memoirs form the emotional core of this immersive and fast-paced tale that uses multiple points of view to tell the story of how Vanna tries to escape both physically and psychologically, aided by her friend and confidante Jare, who has his own reasons for helping her. The Core of the Sun reads like a Finnish Handmaid’s Tale crossed with Brave New World, with more voices, and more hope. Sinisalo mixes Vanna and Jare’s first-person perspectives with primary source documentation from this version of her country and some real history too, like the story of the silver foxes and the early days of eugenics. In this version, Finland has evolved into a “eusistocracy,” in which everyone, male and female, is slotted into rigid gender roles supposedly for the betterment of the whole country. Of course this betterment comes at the price of freedom and Sinisalo makes sure we think about both the benefits and the costs associated with this vision of Scandinavian life.